The public defense of my PhD dissertation with a focus on the qualitative aim where we used participatory design to develop a prototype of probability-based clinical decision support tools for nurses. The outcome was in-hospital clinical deterioration, and this aim complements my other dissertation aim focused on comparing prediction modeling strategies for this clinical outcome. 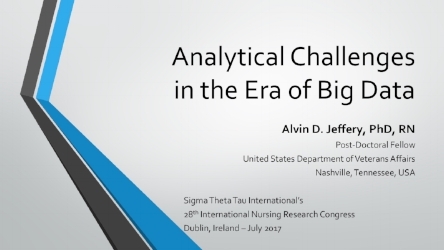 Alvin Jeffery, PhD candidate at Vanderbilt University School of Nursing, discusses a research study where he used a creative method for exploring how nurses might interact with prediction models used in today's healthcare technology. Description & interim findings from my primary quality improvement project within the VA.